Our product will last you a lifetime. We have clients around the world that have been using our shelving for over a half century. Shelves produced in the 1960's still work in today's Lundia product. Our Lundia Solid Wood Shelves and Uprights come with a limited lifetime warranty. 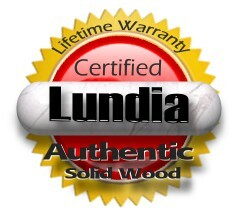 This warranty is valid on all Lundia orders with The Recom Group, Inc. after January 1, 2008. Proof of purchase is required. The Recom Group (TRG) warrants to our original customer that our products are free from structural defects in material and workmanship. Subject to the conditions and limitations set forth below, TRG will, at its discretion, either repair or replace any part of its products that prove defective by reason of improper workmanship or materials. Repaired parts or replacement products will be provided by TRG on an exchange basis, and will be either new or refurbished to be functionally equivalent to new. If TRG is unable to repair or replace the product, it will refund the purchase value of the product. Customer is responsible for freight/shipping costs to and from TRG. This warranty only covers parts that are rendered unusable due to manufacturers defect. Cosmetic or aesthetic imperfections are not covered as wood is a natural product that can and will change over time. This warranty does not cover wood splinters, slight cracks, chips, dents or scratches that have no impact on the structural usability of the product. Because this is real wood, you will have natural coloration variances with different shelves and uprights. Knots are inherent and characteristic of this type of product. All knots will be sanded smooth. You should expect that you will have knots in your shelves and on your drawer fronts, which is typical of solid wood. Any warping or bending of wood is not covered under this warranty as unfinished wood used in high moisture environments may deflect or warp. We recommend adding a finish to prevent this if your home is in an area with high temperature variations. A warped shelf will most commonly occur when it is NOT being used. Rarely will a shelf ever have any warping when it is used in a shelving configuration with books or other product loaded onto it.